Given the intergalactic appeal of the day, people are encouraged to get up and get moving on May 4 in their quest to explore new ways to improve overall health and fitness. Research shows that sitting for long periods of time increases the risk for many health problems, so it’s important that we get up and move during the day. The average American sits more than seven hours a day. 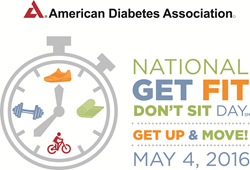 That’s why companies throughout Los Angeles are joining with the American Diabetes Association® to celebrate National Get Fit Don’t Sit Day on Wednesday, May 4, 2016. On this Wellness Day, the Association encourages everyone to limit the amount of time they spend sitting by making sure they get up and move at least once every 90 minutes throughout the work day. Sitting too much for long periods of time can be harmful to health. Just getting up once every 90 minutes to stretch or walk around the office is better than sitting for hours on end in a chair. Employees should take every opportunity get up and move while at work. 1. Take the stairs instead of the elevator at the office and in the parking garage. 2. Get up once an hour and take a quick walk around your office. 3. Stand up and stretch at your desk. 4. If you go out for lunch, walk to the restaurant. 5. If you take public transportation to work, get off one stop earlier and walk the rest of the way to your office. 6. Use a speaker or mobile phone so you can pace around your office during conference calls. 7. Try some chair exercises while at your desk. 8. Fidget (when appropriate! )—tap or wiggle your foot during meetings or while working at your desk. The American Diabetes Association is leading the fight to Stop Diabetes and its deadly consequences and fighting for those affected by diabetes. The Association funds research to prevent, cure and manage diabetes; delivers services to hundreds of communities; provides objective and credible information; and gives voice to those denied their rights because of diabetes. Founded in 1940, our mission is to prevent and cure diabetes and to improve the lives of all people affected by diabetes. For more information please call the American Diabetes Association at 1-800-DIABETES (1-800-342-2383) or visit http://www.diabetes.org. Information from both these sources is available in English and Spanish.